The Shaw Festival’s current production of Brian Friel’s Faith Healer is a brilliant production of a brilliant play. It’s the finest of the three productions I’ve seen and it’s very difficult to see how any production could be better. The three-members of the cast are ideal in their roles, Craig Hall’s direction is sensitive and insightful and the design is well-imagined and highly atmospheric. Some people may find it hard to believe that a play consisting of only four monologues can be satisfying. 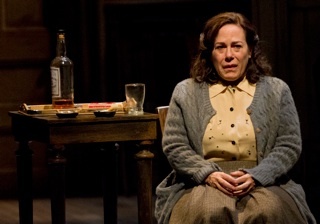 But Friel’s play and the actors’ extraordinary performances will convince you that such play is not merely satisfying but unforgettably thrilling. Irish writer Brian Friel’s now-classic play confounded many when it first appeared in 1979 that a “drama” could be constructed from four monologues without any of the three character interacting on stage. Friel’s play resituates the tension of conventional drama within the act of storytelling itself and within the minds of the audience whose task it is to determine how much is true in the three versions of the story that the three characters tell. This innovative structure has since been imitated by numerous playwrights such as Conor McPherson’s This Lime Tree Bower (1995) and Mark O’Rowe’s Terminus (2007). What the structure emphasizes is the ultimate isolation of individuals from each other and the ultimate subjectivity of experience. Faith Healer begins with a monologue by the title character himself, Francis “Frank” Hardy (Jim Mezon). As if it were an incantation he recites the names of the dying Welsh and Scottish villages he and his mistress Grace and his manager Teddy visited on his travels as an itinerant faith healer. Frank has the gift of divining what ills people suffer from and curing them by laying on of hands. What tortures him is the fickleness of his gift. He knows exactly when he can work a miracle, and, devastatingly, when he will not. What he doesn’t know is why, and his failures have driven him to drink and to vicious rows with his mistress. His tale is marked by three key events. In a church in Glamorgan, Wales, he healed not just one of the people who came to see him, but all ten. In Kinlochbervie, Scotland, he learned his mother was dying. In Ballybeg, Ireland, his home town, he is welcomed back and cures a man of a broken finger. But this cure leads to a greater challenge during which “something terrible” happens. Mezon plays Frank as such a natural orator and storyteller that he wins us over immediately. Mezon speaks Friel’s poetic prose lovingly bringing out every nuance of the words. He makes this “fantastic” faith healer powerful and charismatic, and yet every time he recurs to his incantation of names he suddenly seems to collapse into himself. It is as if Frank must perform this inward ritual in order to muster his strength for his outward performance. Although Mezon as Frank has captivated us, when we move to the monologue of Corinne Koslo as Grace, sunk in her chair in her bedsit in London, doubts arise concerning the truth of what Frank has told us. The first surprise is that Grace says she was Frank’s wife and, in fact, defied her father to marry him. It was just Frank’s joke to wound her that he always introduced her as his mistress. While she agrees with what happened in Glamorgan, what she says happened in Kinlochbervie is something momentous that Frank strangely omitted from his tale. There she gave birth to a stillborn child that Teddy helped bury in a field beside the road. She also says that Frank’s mother died before she and Frank were married. Her details of the event in Ballybeg are different but they still end in “something terrible”. Koslo’s performance is heartbreaking. Grace says with a doctor’s help she is doing much better now, but as Koslo pours herself yet another drink and smokes yet another cigarette the waver in her voice tells us otherwise. She tells us she can now recall events of the past without the fear they used to evoke, but she uses the incantations of place names just like Frank to steel herself to do so. With great subtlety Koslo shows that the more Grace speaks about the past the more troubled she becomes until it seems that she is barely holding herself together. Act 2 begins with the only outright comic monologue of the four. This is the story that Teddy gives of his association with Frank and Grace. First he entertains us with tales of some of the bizarre acts he managed before Frank – like a woman who could speak to pigeons or a whippet who could play the bagpipes – tales so odd that, by comparison, faith healing seems normal. He agrees about the miracle that happened in Glamorgan but has a different view of what happened afterwards. His view of what happened at Kinlochbervie supports Grace’s story, but he feels a sympathy for Frank that Grace cannot. He keeps saying he will tell us about what happened at Ballybeg, but, perhaps intentionally, avoids doing so. He tells us only about getting drunk and about Grace waking him up in terror. Krantz is just as subtle as Koslo in pointing out the contradictions in Teddy’s narrative. Teddy tells us that one of his principles is to keep work and friendship separate, but as Krantz shows, that is just the opposite of Teddy’s relationship with the Hardys. We wonder why a manager would stick with a generally money-losing act like Frank’s, but just by the reverential way Krantz refers to Grace, we realize he has a love for her that neither she nor Frank is aware of. Krantz shows us how Teddy tries to keep the tone of his tale lively and jolly, but his artistry is apparent in his ability to reveal that Teddy’s very effort to remain jolly means he is concealing an underlying sorrow. The return of the fourth monologue to Frank means we now approach what he says with new-found wariness. Yet, despite this Mezon draws us in yet again and leads us masterfully and ineluctably to the play’s shattering conclusion. Director Craig Hall has thought deeply about the play and communicates his insight on every level. For the set Christina Poddubiuk has created a weathered meeting hall off a corridor that reflects the innumerable halls where Frank must have held his meetings. Autumn leaves lie in piles against the walls as if the space has not been used for ages. 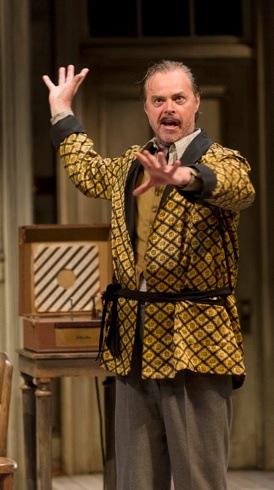 During his first monologue, Hall gives Mezon the stage business of setting up the strewn chairs as if for a meeting and then putting them away again. Once he has set up the chairs for his audience and begins to move among them, we experience a shudder that the invisible audience on stage is us. When Grace later tells us that Frank always referred to his faith healing as a “performance”, this fact only reinforces our feeling that the play is not merely about faith healing in specific, but about acting in general. Teddy tells us that actors are usually brainless because thinking would interfere with their performance. The source of Frank’s problem, he says, is that his intellect suppresses his gift. In contrast to Mezon who paces all about the stage and into the corridor as if he owned them, Hall makes Koslo remain rivetted to her small chair as if huddling there for comfort against the large open space around her – the large open space of the hall and all the memories it evokes. Krantz’s Teddy Hall has stride up and down on a centre line in the room – not as restricted as Grace, nor as expansive as Frank. Krantz tells Teddy’s tales downstage but always retreats upstage to refill his glass of beer as if he, like Frank and Grace, needed “Dutch courage”, as he puts it, to tell his story. Bonnie Beecher’s lighting is extraordinarily atmospheric. She has all three speakers gradually emerge from deep shadows only to sink back into them. When Frank first appears she so lights him that his hat casts his entire face save his mouth in shadow like a spirit arisen from darkness. When the lights are brightest they still suggest the light of fall when the incident at Ballybeg occurred. James Smith’s delicate, eerie music, reminiscent of Eric Satie’s Gymnopédies, reinforces the air of melancholy that permeates the entire production. Irish poet W.B. Yeats’s later plays were heavily influence by Arthur Waley’s 1921 translation of the Noh plays of Japan, where the presiding spirits of a place feel compelled to tell their stories to anyone who will listen. Friel, in turns, seems to be heavily influenced by these later plays. At the end of Faith Healer, one is confronted by questions one does not usually have after a play. Where are we exactly? Who exactly have we been listening to, and when? Friel’s play is so subtle that at the end we have two answers. On the one hand, we are in the archetype of a meeting hall and have seen the essence of characters named Francis Hardy, Grace and Teddy. On the other, we are in the theatre and have seen actors playing their roles. These answers might seem to be far apart, but Friel’s play about faith healing and the audience’s willing suspension of disbelief, uncannily make these answers almost identical. If you have seen Faith Healer before, especially Soulpepper’s unsatisfying production in 2010, be sure to see this one to see how the play should be done. If you have never seen the play before, this is a production no theatre-lover should miss. It will restore your faith in modern drama and expand your notion of what drama can be. Photo: (top) Jem Mezon as Francis Hardy; (upper middle) Corinne Koslo as Grace; (lower middle) Peter Krantz as Teddy. ©2013 David Cooper.